A true Super 16 digital film camera that's small enough to take anywhere! Introducing the pocket sized Super 16 digital film camera that's small enough to keep with you at all times, so you'll never miss a shot! Get true digital film images with feature film style 13 stops of dynamic range, Super 16 sensor size, high quality lossless CinemaDNG RAW and Apple ProRes™ recording and the flexibility of an active Micro Four Thirds lens mount, all packed into an incredibly tiny size! The Blackmagic Pocket Cinema Camera records 1080HD resolution ProRes 422 (HQ) files direct to fast SD cards, so you can immediately edit or color correct your media on your laptop. Blackmagic Pocket Cinema Camera is everything you need to bring cinematic film look shooting to the most difficult and remote locations, perfect for documentaries, independent films, photo journalism, music festivals, ENG, protest marches and even war zones. The digital film camera that's always with you! Regular video cameras shoot limited dynamic range, which is why their pictures look like video. Digital cinema cameras have a much wider dynamic range and is the reason why high end television commercials and feature films look so beautiful. The Blackmagic Pocket Cinema Camera delivers a true film look because it captures a super wide dynamic range of 13 stops, so your images look truly cinematic. This means you retain all sensor data for DaVinci Resolve color grading! Precision engineered with state of the art technology, the Blackmagic Pocket Cinema Camera takes all the high quality features of a professional digital cinema camera and packs them into an incredibly small size. This premium quality design features a solid magnesium alloy chassis, an MFT mount for interchangeable optics, Super 16 size sensor, 13 stops of dynamic range and high quality ProRes 422 (HQ) and lossless CinemaDNG RAW file formats! Every aspect of the image path has been totally optimized for quality! Blackmagic Pocket Cinema Camera features a built in SD card recorder that captures stunning ProRes 422 (HQ) and lossless compressed CinemaDNG files to fast SDXC cards. As an open format, it's compatible with most popular NLE software so you get a digital camera that's perfectly designed for post production workflows. When you’ve finished recording you can easily mount the card straight into a laptop, ready for editing. You can even color grade direct from the card with the included DaVinci Resolve Lite! SD cards are commonly available and can be formatted for either HFS+ or exFAT, making them compatible with either Mac OS X or Windows. Blackmagic Pocket Cinema Camera records into high quality ProRes 422 (HQ) and lossless compressed CinemaDNG files so you retain fine image detail with wide dynamic range for amazing images. This means that Blackmagic Pocket Cinema Camera is one of the few cameras to support true open file formats, so you're not locked into a strange file format that your editing software can't handle. You get two dynamic range settings, film Log or video REC709, so you can choose the right dynamic range for your project. Using DaVinci Resolve Lite you can color correct files natively or transcode them into a different file format to suit your post production workflow. 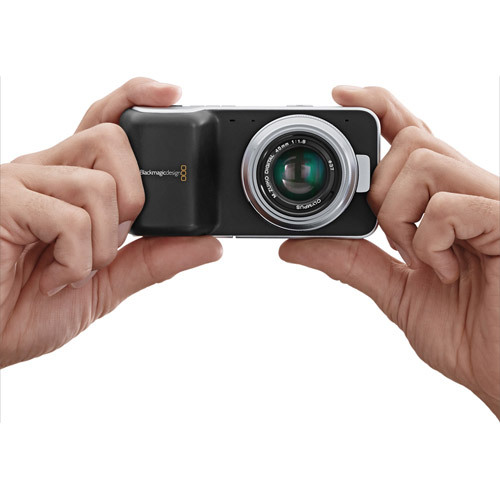 Designed as the world's most compact digital film camera, the Blackmagic Pocket Cinema Camera features a lightweight, elegant design that fits into your pocket. Produced from magnesium alloy for incredible strength, it includes a high resolution LCD for precise focusing and a built in SD recorder, so you get a complete solution without the need to buy expensive accessories. That's vital in such an ultra compact design! With integrated stereo microphones you can also capture great quality sound. The removable rechargeable battery can be swapped quickly, so is perfect when you're on the run! The extremely high resolution 3.5” LCD allows you to monitor while shooting and review recorded files on the SD card. The high resolution screen makes it easy to focus accurately and lets you zoom in to 1:1 size so you focus precisely every time. Camera status displayed at the bottom of the screen shows record status, shutter angle, time lapse interval, aperture setting, ISO, battery level and record time. Blackmagic Pocket Cinema Camera even includes built in metadata entry. The professional connections on the side include a micro HDMI out with optional overlays for easy on set monitoring. You also get a standard mini jack microphone input that's compatible with common AV style microphones, plus a mini jack headphone socket for audio monitoring using headphones. A LANC control input is included for remote operation, and you can power the camera and recharge the removable battery with the 12V DC input. Build the largest rig for the biggest jobs! Big cameras can never be small, but small cameras can be big! 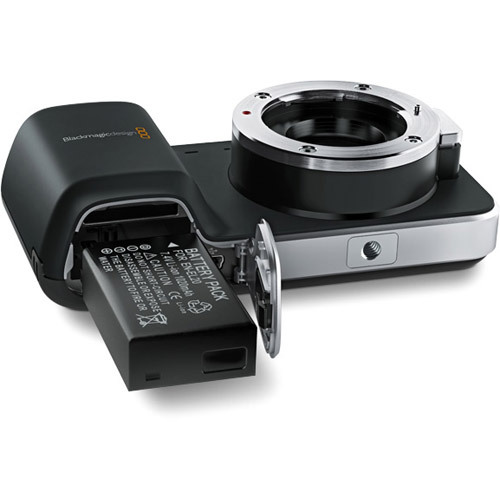 The Blackmagic Pocket Cinema Camera supports a wide range of adapters for converting from Micro Four Thirds to other lens mounts such as PL. This means you can take advantage of the most amazing professional Super 16 cine lenses as well as any other type of professional lens you want to use. The Micro Four Thirds standard lens mount face is close to the sensor, so you have lots of room to add adapters to other lens types! Blackmagic Pocket Cinema Camera is a revolution in digital film camera design! Due to their weight and size, large format digital film cameras are only suitable for use with tripods and other camera support equipment. Until now you’ve never been able to carry a digital film camera with you wherever you go! The Blackmagic Pocket Cinema Camera packs the features and technology of a digital film camera into a truly pocket size design, so you can now shoot film quality images in places and situations that were previously impossible! So tiny you can use it anywhere and keep it with you! 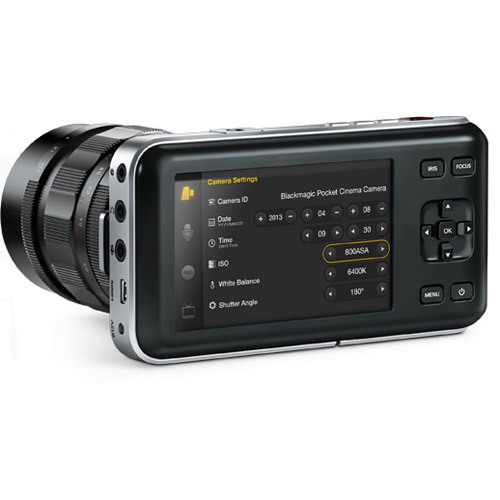 Every feature of the Blackmagic Pocket Cinema Camera emphasizes its portability! With a surface area smaller than many smartphones and weight of only 12.5 ounces, it’s designed to fit in your pocket and your hand! The built in SD card recorder and removable lithium ion rechargeable battery make it easy to swap your media and power for continuous shooting in remote locations. Plus you can set focus and review your shots using the large LCD screen, without the need for a separate viewfinder or monitor! The magnesium alloy chassis is both incredibly light and extremely strong, so you get protection of the camera’s internal electronics in a unit that can be handheld for long periods of time. The design features a grip that adds comfort and stability when shooting handheld. 1/4” thread mounting points are located on the top and bottom of the camera for when you want to mount the camera on a tripod or in a rig, or attach an external microphone or other accessory. The Blackmagic Pocket Cinema Camera has a Super 16 size sensor, which is the perfect ratio and size for stunning 1920 x 1080 HD images. The active Micro Four Thirds mount provides electronic lens control, helps to keep the camera small in size and importantly lets you use the largest possible range of lenses. You can use native MFT lenses from Olympus, Panasonic, Leica and more, or use commonly available adapters for Canon EF™, Nikon F™, ARRI PL™ or 16mm cine mount lenses. Incorporating a large 3.5” LCD is a key component of the camera’s overall design. This extremely high resolution display gives a live view of your images, plus lets you play back recorded files and displays the camera’s adjustable settings. Using such a high quality display lets you set focus easily. Use focus peaking to get a graphical reference of the sharpest parts of your image, plus you can zoom in to 1:1 scale for incredibly accurate focusing. Add mic, remote and monitor! Connecting to the Blackmagic Pocket Cinema Camera is easy, as it uses standard commonly available cables and connectors. The video, audio and remote connections are conveniently located on the same side of the chassis. 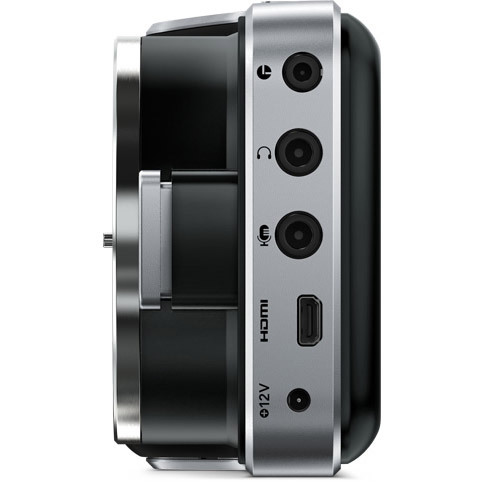 The micro HDMI output lets you connect to electronic viewfinders, monitors, external disk recorders and more. Stereo audio inputs and outputs use 3.5mm stereo jacks for connecting microphones and headphones. Plus you get a 2.5mm jack connection for LANC remote control and the DC power supply for mains operation and battery charging uses a standard 0.7mm plug. When you need to keep shooting, just replace the battery! 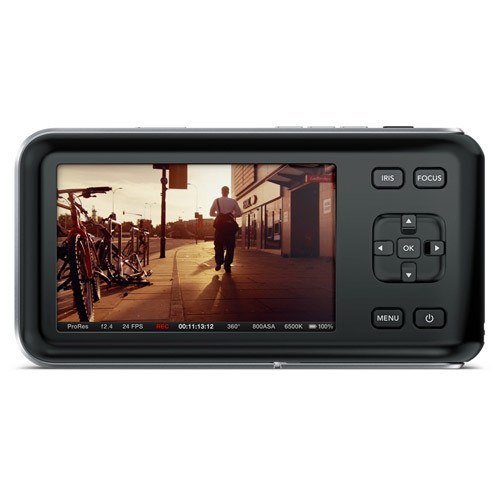 The Blackmagic Pocket Cinema Camera includes a removable and rechargeable lithium ion battery, which provides up to an hour of continuous recording time. The Nikon EN-EL20 battery type is commonly available, so you can purchase multiple batteries if you need to shoot for longer periods. The battery charge time is approximately 1 hour 15 minutes with the camera off. With a wide 12-20V power input range the camera can easily be powered and charged from larger professional camera batteries and other power sources. 3.5" and 800 x 480 resolution. 4 way directional controller for navigating menus and entering metadata. Push buttons for recording and transport control. 1 x 1/4"-20 UNC thread mounting point on top of camera. 1 x 1/4"-20 UNC thread tripod mount. Apple ProRes 422 (HQ) in QuickTime MOV, lossless CinemaDNG RAW. Recording in 1920 x 1080 with choice of Film or Video Dynamic Range. 1 x Micro HDMI Type D output. 1 x 3.5mm stereo audio. 1 x 3.5mm stereo jack headphone output. 2 channels 48 kHz and 24 bit. DaVinci Resolve Lite grading software DVD for Mac OS X and Windows. 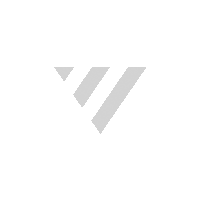 Apple Final Cut Pro, Adobe After Effects, Nuke - The Foundry, Adobe Photoshop, DaVinci Resolve. 1 x 0.7mm DC Jack for power and battery charging. Removable, rechargeable Lithium Ion battery for EN-EL20, 12V-20V DC port for external power and battery recharging. Approximately 1 hour of continuous recording time. Appoximately 1 hour 15 minutes when camera is off, and approximately 2 hours when in use.